A Magical world... straight from the mind of a genious. This is where you make the weapons that will help you realize your dream, and defend you. Here you may post the spells and abilities you have learned. Here is where you shall make the spectacular beings under your control, so you may summon them. Here is where you can make a pet, be it large or small, fierce or cute. Post your completed profile here. edit in the links to weapons, spells, summons, forms, and pets. You may apply for citizenship here.Home to the beautiful Queen Abica, the rightous King Henry and the daring young Prince Cinka. The castle is made of the brightest fire stones that as the sun shines on each stone the castle appears to be painted with fire itself. The inside of the castle glows with the sparkles of crushed fire stones. This way the inside of the castle isnt as bright as the outside. Upon entering the castle, you se a long hallway leading to a set of double doors. Beyond those doors is the throne room; where the Queen and King usually meets with their subjects. From the throne room you can see a flight of stair that no doubt lead to the rooms of the royal family. There are also doors on each wall of the throne room but no traveler or guest to the castle has ever ben hrough them so no knowledge of those rooms is given. Apply for a position here, and names and ranks may be assigned by leader. LEADERS: ask if you want a special name for the armyThe smaller castle beside the Fire Nation Castle is home to the Fire Dragoons. The Fire Dragoons are the Fire Nation's best military and leave up to their title for they possess he power to summon the mighty fire dragoons and often ride them while in battle. They are the strongest fire sprikens in the kingdom other than the royal family. Apply for citizenship here. A beautiful castle decorated with the finest coral gardens, the most beautiful aqua blue coral walls, and its positioned directly under the sun so it glows for miles and miles on end. inside is a stretched halway that leads up to the throne room. across from the throne room is the guest rooms, a kitchen, and a long stairway blocked of to travelers. The stairway leads to the royal chambers. Please apply for a position within. If desired, the leader may PM an admin for a specific name for the Army. This is the military for the Water Nation. The men and women of this title live within the palace and guard the royals very well. They swim and walk around the towns and palace guarding the people from danger. A beautiful city surrounded by waterfalls. The plants seen everywhere is bright coral reefs. The houses are all made of different shades of blue coral. Here the Water Nation palace is located. It is a beautiful aqua blue that is set apart by the rest of the city. Apply for leadership and/or citizenship here. The golden palace is beautifully located right under the sun. Inside the palace is a softer gold color mixed with a bold silver. The throne room is decorated with ruby emerald and other such jewels. Other rooms are the guest rooms, kitchen and royal chamber which is located in a secret section that only the royals know how to enter in. Lead by the brave, wonderful, fierce, and kind captain, Kinsey Sunbeam. Apply for a position here, and leaders may request a special name for the army. Given such a name for their amazing techniques at flying. They are able to fly at such amazing speeds that people often mistake them for falling stars. The men often fly throughout the nation while the women stay at the palace guarding the royals. Named for the star paved strets that glitter as jewels each time the winds bring the sun to them. The homes are made of soft stones which are built on cotton clouds. The Palace is made with gold. 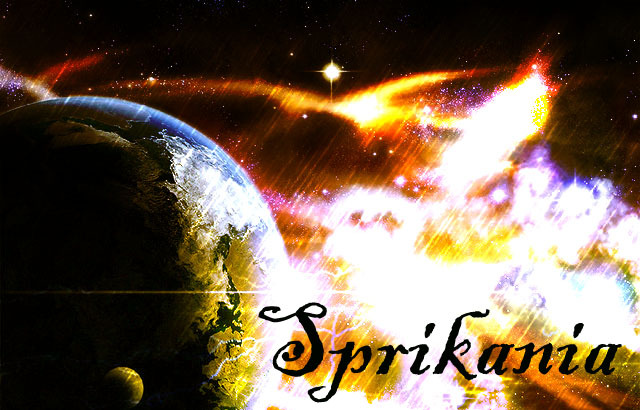 It is often mistaken for the sun due to its beautiful radiance shining across Sprikania. This is easily voted as Sprikania's most beautiful place. Many of the people here always hope to catch a glimpse of their heroine, Kinsey Sunbeam, fly past on her golden wings. Apply for citizenship here. The Castle of the Lightning Nation is a strange mix of Stone and Lightening, for unlike other castles it uses the power of the endless lightening storm that hovers over it to light up rooms and run objects. It is also filled with many strange machines for it is a lab as well as the place where the great King of Lightening lives, if you have a keen eye you can see that the hall ways and rooms have small devices that allow harmless jolts of lightening to run across the walls lighting up a room for a few seconds another jolt soon follows it. The ceiling, floor, walls, and stairs are made up of stone that is pitch black like a starless sky, the doors are made up of a very dark wood that grows only in the lightening Nation and is very strong as well as elegant . It has many different rooms as some are for guest to stay in as other s are used for experiments, it has many lock doors and wandering on one’s own is not a very good idea for sometimes experiments break loose and they might get someone if they are not careful. Apply for a position here. The Chaos Lightening Brigade is stationed in a large tower that is located in the city that the Lightening King's Castle is at, the only way into the tower is the use a special device that turns a person into pure lightening and then get shot into the tower before another device turns the person back into a physical being. The tower has many different levels, some for training, others for the members to sleep in, and the level where the leaders of the Brigade make plans to protect the Lightening Nation and to conquer other nations. The men and women of the Brigade are deployed all over the nation with the use of a machine that is an larger version of the machine that is used to get inside, the machine can turn entire groups of men and women into pure lightening and then fire them anywhere in the lightening nation so the men and women can quickly respond to any threat to the nation as the enemy will be caught off guard when a single large bolt of lightening turns out to be a large squad of soldiers. Electron Harbor is the only place where the ships of the Lightening Nation can get out to sea for it is the only harbor built near a large river that connects to the sea, the Harbor is very valuable for it is the only place for ships to dock and not have to worry about being struck by lightening thanks to the harbor having a large lightening rod that absorbs any lightening bolts that is thrown by the storm over the Lightening Nation. The harbor is also a great place to find things that are not normally found in the Lightening nation and it is also a major center of trade for it sends out the goods that are brought to the lightening nation by boat from the other nations in special caravans that have protection from the lightening storms. But the forest outside the harbor's stone walls is filled with bandits of all kinds that seek to rob the caravans so the Chaos Lightening Brigade must keep constant watch over the place. A strange Temple that is located in the center of the lightening nation and is located right under the eye of the storm the covers the lightening nation so the constant barrage lightening bolts crashing into the ground and heavy winds would scare away anyone that is not of the lightening nation, but no one knows when it was created or who created it but it is made up of a strange indestructible material that is not located anywhere else in Sparikania and it is covered with strange runes that no one has yet to fully understand. The Temple seems to be the source of the storm that covers the lightening nation but it is also protected from harm by the same power for if anyone even tries to harm the sacred temple they would be struck down by the full fury of the storm, but many people of the Lightening nation though seem to be drawn to the temple as they seek to learn how it is able to create a storm that has been around since anyone could remember. They also are very protective of the temple and do not like the thought of people from other nations even getting near the temple without permission from the lightening king himself. Electric Metropolis is the main city of the lightening nation, it is where over 75% of the Lightening Nation's people live and as such it is a giant city far larger than any other in Sprikania. The City is surrounded by giant wall of stone that have giant towers spaced out in the stone wall that serves not only as look out post but also as lightening rods and defensive structures, the towers absorb lightening and if needed can fire it out as a deadly bolt at enemies. The city is so large that machines used to turn people into lightening and shoot people from one machine to another is used to get around, as well as many different elevators to get from one level to another for this city has many tall structures. The city is a place filled with many different kinds of machines that are found only there and as such people from other nations should have someone from the lightening nation guide them around, because it is not rare for people to get lost in the city for days on end before they are found. This place is the location of the Lightening Kings Castle as well as the location of the Chaos Lightening Brigade's HQ which is located in the center of the city. Apply for citizenship here. Many who visit this somewhat melancholy nation marvel at the Blinding silver palace in the middle of Silvercloud city. The lightning from the storms, along with the occasional rays of sunlight, mixed with the luminescence from the city make this marvel of architecture glow with light. Inside the palace is a great, vast, grand hall made of the whitest marble. At the other end of the hall you can see extremely large double doors made of the blackest obsidian sitting wide open, offering passage into the great silver throne-room in which the king is rarely seen. Branching off from the grand hall are many doors crafted with intricate patterns in marble and obsidian. The Palace is built like a labyrinth, with the passages and rooms in a very difficult order, as the creator of the palace was well... insane. The king and his elite guards, who also serve as his royal guard, have all been taught the ways around the palace. it is said that if you can reach the highest room, and peer out the window, you can see the tip of the tower in Arkanna City. The only place in the tower that is strictly off limits is the King's private chambers. These are easy to recognize, as the doors are made purely of obsidian, have large crimson padlocks upon them, and have two very large and powerful elite guardians posted at all times. Apply for a position here. The warriors of the thunder nation are called paladins, because they are all trained with the skill you would expect only for a king's personal guard. Needless to say, the training is brutal and intense. The training for the Elite Guard is then of course, even more rigid and harsh. All that is known to the public is that nearly half the applicants for a position in the royal guard do not survive the training. The headquarters for the troops are underneath the two palaces, directly above the dungeons. The paladins posted in Silvercloud city are dressed in full body heavy armor and are midnight black in color, in contrast to the blinding white of the Arkanna city paladins. The warriors are eager to help a lost individual, but are just as quick to dispatch someone they deem a danger to the thunder nation. Unless you are enlisted in the thunder nation army, even a simple attempt to enter the Paladin's Headquarters is punishable by death. There is also a lightly armored ninja division that is used for secret, covert operations. since those rarely occur, they have been tasked by the king's advisors to track him down when he goes 'walking' in the city. The most beautiful place in the nation, the clouds here look silver here for some reason. This town also surrounds the Castle, and so you will most likely see the king wandering the streets as the royal guard fruitlessly searches for him. The people here are wonderful, and are happy to provide shelter from the endless rain. The houses are crafted of a light gray stone, and the streets of dark cobble stone. One of the deepest Canyons in the Thunder Nation, it's named for the torrential river at the bottom. There is never any such thing as quiet here, for the echo of the river and the river make it so. The town here is built into the cliff, with platforms and walkways made of stolen and/or salvaged metal. It's much darker here than in the rest of the Nation, and the buildings are all the same colors.... silver and crimson. the people here are tough, yet friendly... assuming your weapon's bigger than theirs. Pretty much the Polar opposite of Silvercloud City, this place almost belongs in the Dark Nation. Almost everywhere is painted black and crimson, and from a distance it almost seems that the dark storms are flowing out from the massive tower in the center of the city. Once you get closer, you'd notice the happy and jolly citizens, enjoying everything from gourmet cuisine, shows and entertainment, to sports. The people here love being different, so a new person would easily blend in with the crowd... since no one even looks remotely the same as someone else. The streets also seem to be made of obsidian. The tower in the center of town acts as Valioren's second palace, for his less...formal... parties. Apply for citizenship here. The metal nation Castle is huge. Its more like a fortress, protected by high strengthen metals and other defensive mechanisms. The building is 50 feet high with 5 floors. it is in a circle shape on the out side, the total diameter is 150 feet. With in the 1st floor, there is the main kitchen, dinning room and Living room. On the 2nd floor is where most the guests sleep. There are a few sitting rooms mixed in. One the 3rd, is where the King Sleeps, along with his bathing area, and throne room, and other Royalty things. 4th floor and on are highly guarded by guards and other surprises. Only The king and the guards knows whats past that point. Apply for a position here. Металлический Бог is the metal nation Army. It stands for, juggernaut. The army consists of multiple divisions and branches. There is always room to grow in the ranks, starting from a low rank of a newly joined officer to a high ranking one like a general or commander. Most Foot soldiers carry a little device on them that produces a small shield of magic for them selfs. The armor is pretty thick but light at the same time. The Over all leader of the military is the king of the nation. Technika is a huge metropolis. Its filled with the most advance technology, For this time period. Most of the buildings are made of metal and all kinds of things. Though its highly technical, it doesn't put out as much pollution as one would think. buildings as far as the eye could see and they were tall. Shortest building there is at least 100 feet tall, even the housing districts. The buildings are like apartments, each floor has 4 apartment area's,so at least 40 apartments in one building. There are wondrous parks for the children to play on and to play anything they want to really.Lastly, this is the biggest city in the metal nation. Aranyszin is the city of metal. It has more metal in its structure than Technika, and is the second largest city. Its is rested between a set of mountain's and has metal girders to keep it up. normally any city like this would crumble and fall, but the architects planed it well and the city has survived a lot of harsh things. It stands proud where it is and has the mountains for a natural defense. In side this city and its walls lies a few huge fortresses where the nobility lives. Including the king of the nation. Leingiem is a fairly small village with in the Metal Nation. It’s inhabitants are mostly wild animals, and wild men that live in the forest, and smaller huts with in the city limits. The buildings are built with in and on top of the tree’s of a forest. Here is also a temple of the Over all ruler of Metal nation. This place is located somewhere in the forest, the exact location in unknown, only the inhabitants from there know of its where bout’s, and the king. Apply for citizenship here The biggest castle is said to be built from the suns light. The inside of the castle is outlines in gold and polished with silver ivory and brass colors. The throne room is first room you come to and behind it you see circles of light on the floor. Once you stand on the circles you are transported to different places in the castle. One light transports you to the kitchen, another to the guest rooms, another to the gardens and one takes you to the chambers of the royals. The Soldiers of the dark nation, fierce and terrifying. apply for a position here. The dark nation military is made up of all sprikens in the Daikirai Village. All sprikens are in this military. The children are the first in line then going to the teens and then the young adults back to the oldened sprikens. These sprikens have lost all since of fun and happiness all they know is kill death and fighting. They have become demons under Kannons demonic hand. This city contains the Deleterious Mountain Palace and it is surrounded by a huge and barbed Wall for protection, this city is almost impossible to lay siege too, and in the center of this horrifying place, is the dreaded Deleterious Mountain. The city is pitch black and the only light is the light from blackish purple flames on every other street corner. Apply here to become a citizen. The description is written based on the small reports from many explorers who were lucky enough to stumble across this kingdom. The towers of the castle are both invitingly welcome and yet frighteningly intimidating. The stonework on the castle looks to be freshly placed yet the vines and wild weeds that grow around and up the walls speak of the castle age. The windows are arched and cobwebbed and the dust on them as turned them to appearing as stain glass. Walking into the castle you feel as if you were hit with a blast from the past. The walls are dazzling with the light colors of an open sea and the walls,furniture, and air itself dance with the dust inside the room. The throne chairs aooear to be that of sparkling waterfalls that cascade down to the floor. It is a beautiful sight to behold. Along the left wall is a table holding two anicent tablets protected by a sturdy glass frame. On every wall there are pictures of a beautifully radiant royal couple. The ancient tablets and pictures seem to show the couple as being benevolent masters, and adored by all the world. Some of the explorers have claimed to see a woman with blazing red hair, and a tall, strong yet gentle looking man laughing and enjoying a picnic in the courtyard. Both were elegantly dressed, and very pleasant looking. seemed to be inseperable as well. The rumored couple is known to be true or just images created by the pictures inside the castle, but we do know that given the castles appearance it is easily named The First Kingdom of Sprikania. To enter this army apply here. The Ancient Nation is a place of beauty but beauty must be protected from harm so the nation has its' own army of Paladins called the Order of the Ancients, the army is made up of some of the best soldiers ever to live in this world and the next, they are a very noble army and do not use cowardly tactics and would never harm the innocent or defenseless. They are not based in a central area so killing them all off at once is impossible for they live in their homes with their loved ones until they are called upon, when called to battle they will gather in a special room in the Ancient Castle of the nation as head members gather and discuss what to be done as the rest silently wait for orders. They will then ride out on mighty steeds made of stone and magic that are covered with runes that glow with golden magic as their eyes are made of the same glowing golden magic as they charge with the roar of a thunder cloud and the speed of the wind and will crush anything under their feet at the command of their rider. The Ruins of Varenya rest upon the peak of the tallest mountain in the Ancient Nation, covered by a vast expanse of luscious green. From a bird's eye view, the Ruins are camouflaged by the tall foliage of the mysterious jungle, unable to be seen by those with a precarious eye. Few have even dared to venture to the mountain's top, in fear of the dangerous terrain at it's base which is made up of razor sharp boulders. Those of which were said to once be the battle ground upon which the Ancient Nation's Final Battle was fought before it's fall. Much in contrast to the journey up, the Ruins itself are truly a beautiful sight to behold. Great monuments, crafted by the hands of the most highly acclaimed architects, tower -half shattered and broken- high above the trees. Each stone creation, even the smallest of steps, have been intricately decorated and inset with brilliant ruby and gold stones. The stones -when properly hit by the sun's rays, which happens only once a year- appear to be set aflame, making the Ruins visible. A truly rare sight. Surprisingly though, the Ruins still hold a clean, pure look about them, as if they were still recently built. A mysterious magic works deep within the core of the Varenya Ruins. Those who are lucky enough to even catch the smallest glimpse of the shattered towers can feel the power emanating from the glorious Ruins. The forests are truly a mythical place. The trees in the forests range from beautiful jewel studed leaves to that of golden leaves to even that of silver leaves. The forests has been rumored to be the favorite place to visit for the emperor. Hed often go to the forests and return with a different branch of a ruby, emerald, or sapphire leaf tree to give to his emperess. The ground of the forests is black with small daimonds in it making the ground seem like you were walking on space. The creatures in the forests are rare and have been said to be extinct in the other areas of Sprikania. Even on the brightest of days the forests stay pitch black save for the glow of the fireflies and the glowing leaves on every tree. the trunks of the trees also glow with a sparkling ivory. The forests of Denduron are truly the most beautiful place to be in all of Sprikania, sadly everything here is rumored and isnt known for sure to even extist. Begoru is a widely spread city across the largest of Plains in the Ancient Nation. The sky is permanently blackened, covered with the deepest purple of clouds, leaving not a sliver of the star speckled sky visible. Not even the sun, nor the moon can break through the thickness of the clouds, making it near impossible to tell the time of day. Though not all is lost in darkness, for the clouds are not the simplest of clouds. Electric purple streaks of lighting flash down from the sky, brilliantly keeping the city lit. The bolts ravage throughout and around the city, yet every sleek building and home are kept perfectly intact. Rather than being destructive, the lightning feeds the city, keeping it strong and alive. Each building and monument have a soft purple aura around them, the electricity flowing through them so strong that it becomes visible to the naked eye. The buildings and homes are created of a dark, yet transparent stone, giving the city a delicate, glass like appearance. Begoru city literally sparkles with the element and stands alone in the darkened planes, like a sentential protecting the Ancient Nation. post your fanfics about sprikania here. Post advertisements for other sites here, but be sure to remember sprikania.